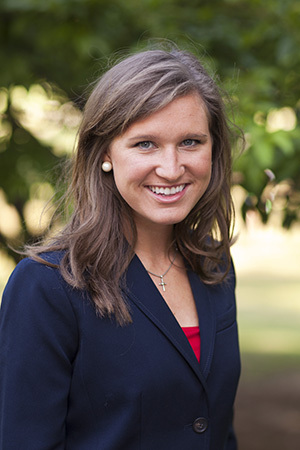 Two Samford University seniors have been "brand ambassadors" for April. And, ironically, both happen to be Samford Ambassadors. Jay Gilmer is a senior entrepreneurship major from Selma, Ala. 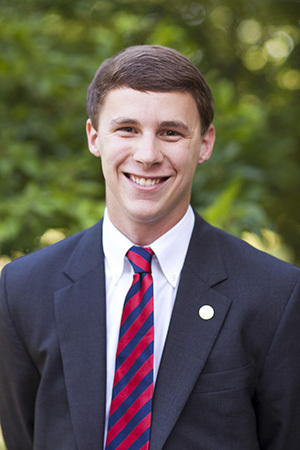 In addition to serving as a Samford Ambassador, Gilmer was active with the Red Sea student spirit organization and in helping promote pre-game tailgating on the University Quadrangle. The person nominating Gilmer related a story about an encounter Gilmer had with a Samford staff member who suggested that the university did not need to do tailgating for every game. Gilmer responded that the university "most certainly would be tailgating for every game, every year, from now on." Allison Hubbard is a senior journalism and mass communication major from Madison, Miss. In addition to being a Samford Ambassador, Hubbard is active with Phi Mu sorority. She also has been supportive of the tailgating project, specifically the Phi Mu and Mississippi parents and students tent. The person nominating Hubbard noted that she has missed only one Samford football game - home or away - during her four years as a Samford student. Both Gilmer and Hubbard regularly can be seen wearing Samford apparel on campus and participating in campus activities. Both also are active in community service projects sponsored by Samford. In a new initiative launched in January, Samford's Office of Marketing and Communication is promoting the concept of every member of the university community as a "brand ambassador." "Every member of the university community represents Samford in all that they do," said Philip Poole, executive director of the Office of Marketing and Communication. "It is important for us to recognize that we are brand ambassadors and to put our best foot forward whether answering the telephone, greeting someone on campus or responding to an inquiry from a constituent." But, Poole added, it also includes representing the university in the community, helping to tell the Samford story to those who may not be familiar with the university and ensuring that the university's brand is positively depicted. Previous brand ambassadors of the month are staff member Elizabeth Wells and students Hannah Dawson, Clayton Hurdle and Devynne Roahrig. Nominations for brand ambassador of the month should be submitted in writing to samnews@samford.edu.